Although we spend most of our on-the-water time these days behind the lens or testing boats for the yachting press, we also try to do some racing. We did a lot in years gone by and, while time currently precludes running our own boat, it’s still good to race with other people on boats that are well campaigned. This year we were asked to race in Cowes Week on a boat that has an excellent track record in south coast regattas – including Cowes. We couldn’t do the whole week, but signed up for the last three days. 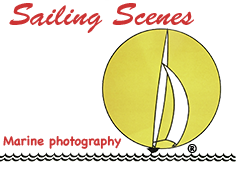 For most of our sailing career we have owned and raced our own boats, or helmed boats belonging to other people or companies we’ve worked for. It's good to take on other roles from time to time as well, though: any skipper or helmsman should really be able to do (or have done) any job on the boat – including foredeck. People often start their sailing career at the bow and work their way aft as experience and girth increase and mobility decreases, the notion being that youth and agility are needed at the pointy end while brain, preferably accompanied by a measure of brawn, is called for in the cockpit. In practice, the fastest boats tend to be those on which anyone on board could perform any role: the guy (or girl) doing mast, for example, will do a better job if he or she is a competent sailor in his or her own right, able to read the course and understand and anticipate tactical decisions. Starting your career at the helm and then finding yourself moving towards the bow is definitely not the conventional route, but at Cowes we were volunteered to do the job for which people will rarely put their hands up, especially on a boat with a symmetrical spinnaker: foredeck. Foredeck is by far the most under-valued role on many boats. A good foredeck crew is almost invisible. Things just happen as they should and no one notices. But they do notice when things go wrong. The guy or girl at the sharp end probably has more opportunity to get things wrong than anyone else on board except the helmsman. Foredecks aren’t seen to win races for their boat, but they can most certainly lose them. When we joined the boat in Cowes, the team had already notched up some good results but also used the only discard in the seven-race series, so we had to sail fast and minimise mistakes. That’s what we managed to do, recording another first on the Wednesday to put us firmly in contention in our 30-strong class. After that a more conservative approach was in order. We kept a close eye on the numbers, did what we needed to do and ended the week with a margin of seven points over the second-placed boat. Racing at this sort of level, every role is crucial, from the helming and navigation to packing the spinnaker (another under-valued job, often done under pressure in a bouncy cabin at 20° of heel). At the sharp end, apart from the inevitable leaping around and getting wet (and bruised), we had to think about wind direction, the next mark rounding, the course of the next downwind leg, the strength and direction of the current and, of course, whether that meant a bear-away set or a gybe set. Then, at the leeward mark, whether the following downwind leg meant we should do a conventional leeward drop, a float drop or a windward drop. All this has to be discussed with the navigator and helmsman and conveyed to the rest of the crew. Doing foredeck doesn’t allow you just to hike on the rail, enjoy the scenery and disengage the brain on the way upwind. 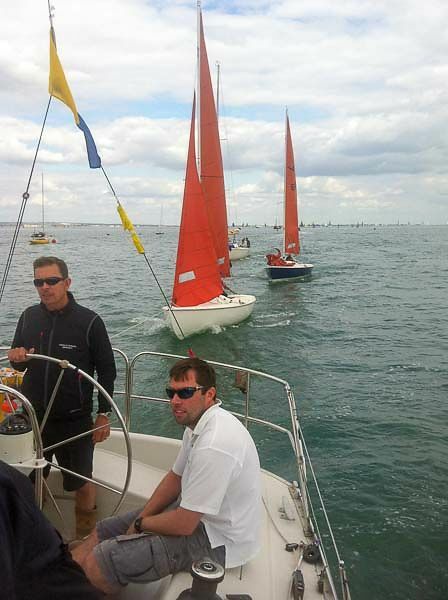 We were in Cowes to race, but also wearing our media hat. A boat we had photographed in the Round the Island Race was there, and we made contact with the owner about a possible Sail Clinic feature in Practical Boat Owner. One of the competitors in our class we got chatting to had been struggling for pace during the week, so again we offered our Sail Clinic services. If we could come away from Cowes with leads for two magazine features it would certainly help. Inevitably we also bumped into a good many existing contacts, both racing and in the media. The question from all quarters was 'taking lots of photos, then? ', the assumption being that we were there in photography mode. When the questioning changed to 'how did you get on? ', we could answer, 'we won'. It's always good to be able to say that. The racing was too full-on for any on-board photography, but here we are doing a good turn by giving a pair of becalmed Squibs a tow back to Cowes.